O ônibus parou em frente à atração turística. De dentro saíram milhares de japoneses, uma parada militar de saúvas, todos ostentando câmeras, todas alinhadas a laser na mesma direção, o mesmo objeto, o mesmo olhar. Alguns astrônomos cogitaram de usar o resultado para interferometria, até que alguém observou que os comprimentos de onda visíveis requeriam uma separação microscópica entre os CCDs. Feitas as fotos do monumento, os japoneses iniciaram uma estranha coreografia, onde, com coordenação impecável, conseguiram fotografar uns aos outros em todas as combinações possíveis, sem repetição. Então voltaram para dentro do veículo, com tanta ordem e celeridade quanto houvera em sua chegada. Naquela noite, derrubaram o servidor do Flickr. Today I shall dabble in two different topics within the same overall subject, which is DC Comics’ super-hero comics. These two topics have a point of contact that deserves review, and this is why I have come here. The first topic is the annuals. DC Comics issues its super-hero titles monthly. (Everything I say in this text is true as a rule in 2013, but the titles change over the years and my reading is still in 1996, so that the specific examples I give are from that year.) Thus, Superman’s continuing adventures are out in Action Comics, The Adventures of Superman and Superman; Batman’s in Detective Comics, Batman, Batman: Shadow of the Bat and The Batman Chronicles; other heroes are published in Wonder Woman, The Flash, Robin, Catwoman and many, many other titles that the lay public would not recognise, such as Nightwing, Azrael and Impulse. Usually, each one of these series has twelve issues a year. The most popular of them are matched by other, yearly series, which are equivalent to special editions — as if they were thirteenth issues of the main title. These are the Annuals, as in Action Comics Annual, Batman Annual, Flash Annual. According to DC’s practice, the story that comes in an Annual is not a part of the storyline that is told over months in the main series; yet it is a part of the official chronology. Each Annual usually has more pages than the corresponding monthly title, and some have more than one story per issue. In the 1990s, DC used to give the same theme to each year’s Annuals. For example, in 1991 all of them were interesting tie-ins to the Armageddon 2001 event. In 1994, all of them were Elseworlds stories. In 1996, all Annuals brought the subtitle “Legends of the Dead Earth”. Each one told a story that was not necessarily compatible with those of the other Annuals, but each writer was in charge of creating variations on the same theme: a distant future when planet Earth no longer exists. In this future, the hero from the regular title (not the one in the Annual) has been dead for centuries, but his or her memory lives on somehow, and another hero follows on his or her footsteps. Batman Annual #20. Weak story. Green Lantern Annual #5. Fun story. Most of these Annuals turned out unimpressive. This is not exactly a surprise, seeing as that, according to Sturgeon’s Law, 90% of all cultural production is trash. It could not be otherwise: first, statistically it would not make sense that everything were good, and this is exactly why the word “mediocre” has ceased to mean just “average” and started to mean “bad”; second, by definition you will only notice that something is good because it stands out from the rest, and this is where the word “good” starts to have its meaning. If everything were good, you would not realise that it were good, nor would you, therefore, even be aware of the concept or have a name for it. Precisely because of all this, when one of these Annuals turned out much better than the others, it drew my attention. I refer to Legionnaires Annual #3, which was one of the last Annuals of 1996, having been published along with December’s regulars. Differing from the other Annuals of 1996, this one had its story as an aftermath of another that took place in a main title. This is where we hold the discussion of 1996’s Annuals and enter the second topic, which is the chronology of the many characters named “Flash”. As it is in the case of most any other DC super-hero, a full chronology would deserve lengthy explanations and due commentary. Unfortunately, because of the scope of this article, I will have to leave the treatment that the Flash deserves for a later date, because that would be too long an exposition, with too many details. Just you believe that everything I say hereunder has a fascinating, minutiae-ridden story behind it, and do yourself the favour of researching it, because there are lots of effort and creativity involved. For now, let us move on. Follow me. Historically, the nickname “The Flash” was first attributed to a character called Jay Garrick who had acquired super-speed. This Flash’s stories were published from 1940 to 1949, during the Golden Age of comics, and then his monthly book Flash Comics ceased to be published. Maybe you still remember him: red shirt, blue trousers, helmet, maskless. Jay Garrick, the first Flash. I tried to use Wikipedia’s image, but WordPress will not allow it. So go there and type “Jay Garrick”. In 1956, DC Comics revamped the concept and launched a new character named Flash. 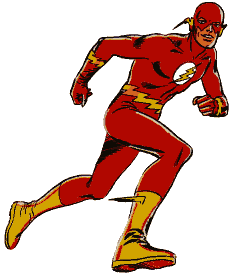 This time, the runner was an often-late police chemist called Barry Allen, who was gifted with his superpower when struck by a lightning in the Chemistry lab. This second Flash gave continuity to Flash Comics and today is considered to be the character who gave DC’s Silver Age of comics its start. This is the Flash who became famous, whom readers came to love and whom the lay public is aware of. He is the epitome of the good-hearted hero willing to sacrifice his own life to save the others’ — in some cases even more so than Superman himself, who is considered the archetypal super-hero for all his physical and psychological traits. In 1961, with the publication of The Flash #123 and its story “Flash of Two Worlds!”, writer Julius Schwartz brought forth the concept that, in my view, is the most ingenious and mind-stimulating idea in the whole DC Universe: the notion of parallel universes where the heroes have counterparts who are like different versions of the same person. With this issue, it was retroactively established that the old Flash (Jay Garrick) kept on existing despite no longer being published. It is just that his adventures took place in another universe, in so-called Earth-2. By jumping dimensions, Barry Allen meets Jay Garrick, declaring himself his admirer and follower. The Flash #123, a classic issue. This story changed the whole DC universe. An original copy is worth more than a thousand dollars, but, fortunately, it is easy to find reprints. In the following years of the Silver Age, we learned that all the heroes who had been published during the Golden Age (from 1938 to 1951), including Superman, Batman and Wonder Woman, were a part of Earth-2, while the heroes that were being published from 1955 were set in Earth-1 (in Brazil, “Active Earth”). Thus there were two Supermen, two Batmen, two Wonder Women, two Green Lanterns (one of them being Alan Scott, the other Hal Jordan), two Flashes etc., one of each on each Earth. The vast majority of DC’s regular titles told the adventures on Earth-1, but, in the 80s, some titles started to tell of adventures that continued on Earth-2, outside of DC’s main chronology. The meetings of heroes from the two universes were much celebrated, especially those in the anxiously anticipated stories that were out once a year in the regular issues of Justice League of America. In 1984-1985, the monthly The Flash threw Barry Allen to the 30th century, in a long and complex storyline where he never went back to his original time. When the Crisis on Infinite Earths came about, Barry made the final sacrifice to save the many Earths, but no one witnessed his death. 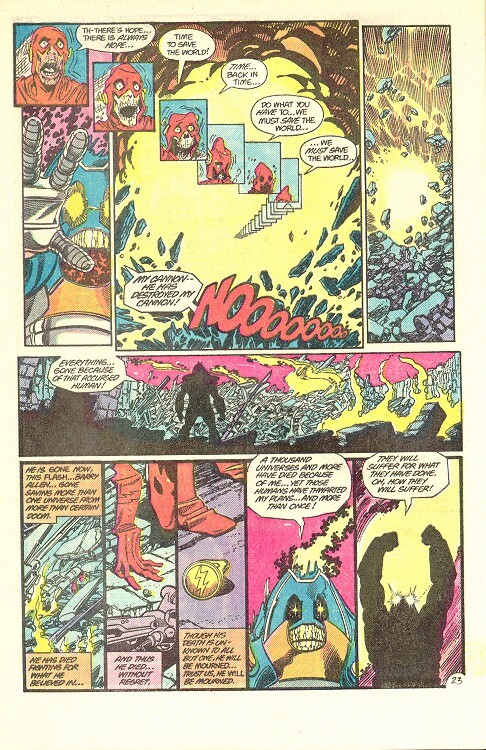 According to George Pérez, Barry was chosen to be a martyr because the idea of a DC multiverse had begun with him, therefore also with him this multiverse would end. Barry Allen’s final sacrifice, saving DC’s universes in his last race. 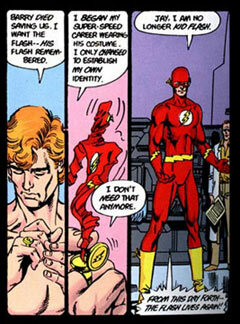 Then, in a turn of events which was very controversial at the time and which attracted the fury of many a fan, not only did Barry stay dead definitively(*) (which never happens to any comic book character, but finally happened to him) but also he was succeeded by Wally West, the nephew of his wife. Wally was an old acquaintance of the readers’, because he had undergone the same kind of freak accident as Barry had before him (yeah, writers could be less creative during the Silver Age) and, for a good time, followed in the footsteps of his beloved and admired uncle-by-marriage as Kid Flash, having, by the way, been a part of the Teen Titans and of the New Teen Titans. With Barry’s passing, Wally became the third Flash. At the end of the Crisis, Wally takes on the legacy of his uncle-by-marriage. Wally West as the third Flash, after the Crisis. In 1994-1996, the monthly The Flash was written by brilliant Mark Waid, Author of the masterpiece Kingdom Come and one of the writers who best understand and respect their characters. Waid wrote many stories where he rounded up the many super-speedsters of the DC universe, and I love stories that join up variations on the same character. In particular, Waid’s stories on this motif are excellent and inspired. Besides, at the time when he was writing the Flash, Waid raised this character’s superpower to something greater than him, inserting Wally into a continuity where a single force in the universe was the moving source of all the super-speedsters. Suddenly, the Flash’s superpower was no longer unique, and it was revealed that it was derived from an energy field which common mortals were incapable of reaching: the Speed Force. In Waid’s hands, the Flash became sort of a Jedi knight of speed, a privileged man who, just like Neo in The Matrix and Luke Skywalker in Star Wars, had access to understanding hidden meanings in reality and to perceiving universe, time and space with a zen sense of unity. The Speed Force has the effect of a power that is neither magical nor, however, understood or even noticed by humans, an energy that permeates the universe and which only the super-speedsters are able to explore. Therefrom spring some very interesting stories where we can see the world in slow-motion through the eyes of the scarlet racer as Wally gradually finds out that his speed power brings many side benefits, such as time travel and the possibility of giving other people a “ride” on his speed. Also, writer Waid treated Barry Allen’s memory with religious reverence, endowing Wally with the desire to better know the destiny of his uncle in the 30th century and to contact the expanded reality which had fed Barry and which only now became visible to himself. At the beginning of 1996, The Flash told the many-part Dead Heat story arch, where Wally strove to stop the villain Savitar from disabling all heroes whose superpower is their speed: Wally himself, Jay Garrick, young Impulse (Bart Allen, a grandson of Barry’s, born in the 30th century), Johnny Quick, his daughter Jesse Quick, wise Max Mercury (a time-traveling speedster revamped by Waid, born in the Old West and, already at a certain age, a mentor for the other speedsters) and some others. In order to beat Savitar, Wally had to accelerate in a way that had never been demanded of him, entering the timestream and, out of control, traveling to the 64th century. In the Race Against Time! story arch, after defeating Savitar and already in the second half of 1996, Wally tries to return to his time in successive jumps back the centuries. One character who helps him is John Fox, the Flash of the 27th century, heir to the mantle out of inspiration by the memory of both Barry and Wally. Following the continuity of stories, I am now in (or at) December 1996, at the point where Wally manages to return to the 20th century. It just so happens that, when he was still fighting Savitar earlier in the year, Wally was helped by a racer codenamed XS, who, by the way, is also Barry Allen’s granddaughter born in the 30th century (and Bart’s cousin). In Dead Heat, XS had gone back in time, from her 30th to the 20th century, along with her colleagues from the Legion of Super-Heroes, and had become stuck here. Just like Wally resorts to using the Speed Force to come back from the future to the present (and ultimately succeeds), XS attempts to jump in the opposite direction, from the present to the future (which is “her present”). In the 1996 issues of the monthly The Flash, the young heroine XS is just a supporting character, and there comes a moment (in the first chapter of Race Against Time!, The Flash #112, April 1996) when John Fox and Jay Garrick give her a hand in time-jumping. XS disappears, the Reader is led to assume that she has managed to get home, and the story turns its focus back onto the Flash, his misfortunes and his own happy return. Barry gives XS the privilege and the honour of running along with him and then works as a catapult for her, sending her again into the timestream. This time, XS ends up in the 100th century, where she learns that Earth is no longer (this being the common point with the other annuals of 1996, Legends of the Dead Earth), as the Legion of Super-Heroes is no longer either. On the planet Almeer-5, humanity is oppressed by the villain Nevlor, who has imprisoned the few remaining metahumans. One of the heroes in jail is Avatar, who wields the ancient Spear of Destiny, which can only be raised by those worthy of it. Her outfit resembles those of Jack Kirby’s gods, particularly that of Marvel’s Thor, whose hammer Mjölnir only those worthy are able to raise. Another heroine is Melissa Trask (an anagram of “Stark”, get it? ), who is a brilliant electronics engineer and has crafted a flying armour that fires bolts from its hands (just like Iron Man’s armour…). The third hero is Robert “Bob” Brunner (just as Robert Bruce Banner, right? ), who, thanks to an energy transfer (gamma rays? ), has transformed into a megamuscular blue giant (not green, OK?). His clothes are torn and he is left in his shorts as he throws puny humans about. The last hero, said to be the greatest of all in the 100th century, does not have any superpower, but has arrived there in suspended animation to lead them with his winged helmet and his star-chested uniform (just like, let us see, a certain Captain America…). With XS’s help, the heroes escape and regroup in a new secret base built by Stark Trask, the Avengers Mansion. You may note that the words “Almeer” and “Nevlor” contain the letters of “Marvel” and (Stan) “Lee”. Receiving new assistance from this “Avenger” Legion of the 100th century, XS again enters the timestream, but, instead of getting home, she ends up at the Vanishing Point, the Linear Men‘s space base, located statically in a parallel dimension during the last time instant before the end of the universe. Sometimes the Vanishing Point appeared in DC’s stories from the 90s, including the miniseries Zero Hour. There XS meets the Time Trapper, a villain from the Legion of Super-Heroes’s stories — whom she did not know of, since there were no confrontations with him after she joined the Legion. The Time Trapper commands the timelines, which he often manipulates in order to change events in his own favour, but, in this brief encounter, he introduces himself to XS as someone who behaves as such to the benefit of the human race, as opposed to the Linear Men, who patrol timelines against interference and, among other things, stop planet Earth from being saved from destruction. Under this point of view, the Time Trapper is the hero! Before he sends her back to the 30th century, XS gets to witness the events of Zero Hour from the Linear Men’s perspective. Though she does not understand what is going on (as she is a character created by Mark Waid after the publication of Zero Hour), the Reader can recognise several speeches by the Linear Men, by Waverider and by the Atom, as well as the Atom’s death, which was one of the outcomes of that miniseries. The writer never makes it explicit that what we are looking at is Zero Hour, but leaves the conclusion very much available whilst we can observe the same happenings from a different viewpoint. Curiously, the story in Legionnaires Annual #3 was scripted not by consistent, careful Mark Waid, but by Roger Stern. It is so coherent, so well fitting in the DC universe, so in line with the Flash’s tales to which it connects, so perfectly elegant before the chronologies of Zero Hour and of the Legion of Super-Heroes, that one would think that Waid were its true Author. The adherence to continuity and the respectful (as opposed to mocking) treatment of Marvel’s heroes indicate a connection of affection to the comics that we typically see in Waid’s work. Here I leave my compliments to the excellent job accomplished, not only by him who wrote but also by those who drew (Tony Castrillo, Chuck Wojtkiewicz and Dan Jurgens, the last of whom pencilled the “Zero Hour” sequence and had also been the penciller for the original Zero Hour miniseries) and especially those who edited (Ruben Díaz and KC Carlson, who had been one of Zero Hour‘s editors). (*) Yes, I am partially aware of the effective return of Barry Allen after the Final Crisis. As I said, my reading is in 1996 and, at this point, DC stands by its intent to keep Barry definitively dead. Hoje tratarei de dois tópicos diferentes dentro de um mesmo assunto, que são os quadrinhos de super-heróis da DC Comics. Os dois tópicos têm um ponto de contato que merece resenha, e foi por isso que vim aqui. O primeiro tópico são edições anuais. A editora DC Comics publica mensalmente os títulos que trazem as histórias com seus super-heróis. (Tudo que digo neste texto é verdade como regra em 2013, mas os títulos mudam com o correr dos anos e minha leitura ainda está em 1996, de modo que os exemplos específicos que dou são daquele ano.) Então, as contínuas aventuras do Super-Homem saem em Action Comics, The Adventures of Superman e Superman; as do Batman, em Detective Comics, Batman, Batman: Shadow of the Bat e The Batman Chronicles; outros heróis saem em Wonder Woman, The Flash, Robin, Catwoman e muitos, muitos outros títulos que o público leigo não reconheceria, como Nightwing, Azrael e Impulse. Normalmente, cada uma dessas séries tem doze edições por ano. As mais populares são acompanhadas de outras séries com periodicidade anual, que, na prática, equivalem a edições especiais — como se fosse uma décima-terceira edição do título principal. São os Annuals, como Action Comics Annual, Batman Annual, Flash Annual. Pela prática mais comum da editora, a história que vem em um Anual não integra a sequência da história que está sendo contada ao longo dos meses na série principal; mas, mesmo assim, faz parte da cronologia oficial. Cada Anual costuma ter mais páginas do que o título regular correspondente, e alguns têm mais de uma história por edição. Nos anos 90, a DC costumava dar um mesmo tema aos Anuais de cada ano. Por exemplo, em 1991, todos foram interessantes histórias vinculadas ao evento Armageddon 2001. Em 1994, todos foram histórias do tipo Elseworlds. Já em 1996, todos os Anuais traziam o subtítulo “Legends of the Dead Earth”. Cada um contava uma história que não era necessàriamente compatível com as dos outros Anuais, mas a cada roteirista a editora incumbiu de criar uma variação sobre o mesmo tema: um futuro distante onde o planeta Terra não existe mais. Nesse futuro, o herói publicado pelo título regular (não o do Anual) já morreu há séculos, mas sua memória sobrevive de algum modo, e outro herói segue sua tradição. Batman Annual #20. História fraca. Green Lantern Annual #5. História divertida. Na sua maioria, esses Anuais ficaram ruins. Isso não é exatamente uma surpresa, já que, de acordo com a Lei de Sturgeon, 90% de toda a produção cultural é lixo. Não poderia ser de outro modo: primeiro que, estatìsticamente, não faria sentido que tudo fosse bom, e é justamente daí que a palavra “medíocre” deixou de significar apenas “médio” e passou a significar “ruim”; segundo que, por definição, você só repara que alguma coisa é boa porque ela se destaca do resto, e é daí que a palavra “bom” passa a ter significado. Se tudo fosse bom, você não perceberia que fosse bom, nem, portanto, teria sequer o conceito ou um nome para ele. Justamente por tudo isso, quando um desses Anuais ficou bem melhor do que os outros, ele chamou minha atenção. Refiro-me a Legionnaires Annual #3, que foi um dos últimos Anuais de 1996, tendo sido publicado junto com os regulares de dezembro. Diferente dos outros Anuais de 1996, este fez sua história como continuação de outra que acontecia em um título principal. É nesse momento que suspendemos a discussão dos Anuais de 1996 e entramos no segundo tópico, que é a cronologia dos vários personagens chamados “Flash”. Tal como no caso de qualquer outro super-herói da DC, uma cronologia completa mereceria extensas explicações e os devidos comentários. Infelizmente, diante do escopo desta discussão, vou ter que ficar devendo o tratamento que o Flash merece, porque seria uma exposição muito longa, com muitos detalhes. Apenas acredite que tudo que eu digo a seguir tem uma história fascinante e minuciosa por trás, e faça a si mesmo o favor de pesquisá-la, porque há muito esforço e muita criatividade envolvidos. Por ora, prossigamos. Acompanhe. Històricamente, o epíteto “The Flash” foi atribuído a um personagem chamado Jay Garrick que havia adquirido supervelocidade. As histórias desse Flash foram publicadas de 1940 até 1949, durante a Era de Ouro dos quadrinhos, e então sua revista Flash Comics deixou de ser publicada. Talvez você ainda se lembre dele: camisa vermelha, calça azul, capacete, sem máscara. Jay Garrick, o primeiro Flash. Tentei usar a imagem da Wikipedia, mas o WordPress não aceita. Então vá na Wikipedia (em inglês, por favor) e jogue “Jay Garrick”. Em 1956, a DC Comics reformulou o conceito e lançou um novo personagem com o nome de Flash. Desta vez, o corredor era um químico forense e atrasildo contumaz chamado Barry Allen, que adquiriu seu superpoder ao ser atingido por um raio no laboratório. Este segundo Flash deu continuidade a Flash Comics, sendo hoje considerado o personagem que inaugurou a Era de Prata dos quadrinhos na DC. Esse é o Flash que ganhou fama, que os leitores passaram a amar e que o público leigo conhece. Ele é a epítome do herói de bom coração disposto a sacrificar a própria vida para salvar a dos outros — em alguns casos mais do que o próprio Super-Homem, que é considerado o arquétipo do super-herói por todos os seus aspectos físicos e psicológicos. Em 1961, com a edição The Flash #123 e sua história “Flash de dois mundos”, o roteirista Julius Schwartz trouxe o conceito que, a meu juízo, é o mais genial e estimulante de mentes em todo o Universo DC: a noção de universos paralelos onde os heróis têm contrapartes que são como diferentes versões da mesma pessoa. Com essa edição, ficou retroativamente declarado que o antigo Flash (Jay Garrick) continuava existindo apesar de ter deixado de ser publicado. É que suas aventuras aconteciam em outro universo, na assim chamada Terra-2 (no Brasil, “Terra Paralela”). Exercendo um salto dimensional, Barry Allen encontra Jay Garrick, declarando-se seu admirador e imitador. The Flash #123, uma edição clássica. Esta história mudou todo o universo DC. Um exemplar original custa mais de mil dólares, mas, felizmente, é fácil encontrar reimpressões. Nos anos subsequentes da Era de Prata, aprendemos que todos os heróis que haviam sido publicados durante a Era de Ouro (de 1938 a 1951), inclusive Super-Homem, Batman e Mulher-Maravilha, faziam parte da Terra-2, enquanto os heróis que estavam sendo publicados desde 1955 estavam ambientados na Terra-1 (no Brasil, “Terra Ativa”). Logo, havia dois Super-Homens, dois Batmen, duas Mulheres-Maravilhas, dois Lanternas Verdes (sendo um deles Alan Scott e o outro Hal Jordan), dois Flashes etc., um de cada em cada Terra. A grande maioria dos títulos regulares da DC contavam as aventuras da Terra-1, mas, nos anos 80, alguns títulos passaram a contar as aventuras que continuavam na Terra-2, fora da cronologia principal da DC. Eram muito comemorados os encontros de heróis dos dois universos, especialmente nas ansiosamente esperadas histórias que saíam uma vez por ano nas edições regulares de Justice League of America. Em 1984-1985, a revista The Flash lançou Barry Allen ao século 30, em uma longa e complexa história onde ele nunca mais voltou a sua época original. Quando houve a Crise nas Infinitas Terras, Barry fez o sacrifício final para salvar as várias Terras, mas ninguém testemunhou sua morte. De acordo com George Pérez, Barry foi escolhido para mártir porque com ele havia começado a ideia do multiverso na DC, portanto também com ele se extinguia esse multiverso. O sacrifício final de Barry Allen, salvando os universos da DC em sua última corrida. Então, em uma reviravolta que foi bastante controversa na época e atraiu a fúria de vários fãs, não apenas Barry ficou morto definitivamente(*) (o que nunca acontece com personagem nenhum de quadrinhos, mas finalmente aconteceu com ele) como foi sucedido por Wally West, sobrinho de sua esposa. Wally já era conhecido dos leitores, porque havia sofrido o mesmo tipo de acidente de Barry (pois é, os roteiristas eram menos criativos na Era de Prata) e, durante um bom tempo, seguiu os passos de seu amado e admirado tio-afim como Kid Flash, tendo, aliás, feito parte dos Titãs e dos Novos Titãs. Com a morte de Barry, Wally passou a ser o terceiro Flash. Ao fim da Crise, Wally assume o legado do tio-afim. Wally West como o terceiro Flash, após a Crise. Em 1994-1996, o título The Flash era escrito pelo brilhante Mark Waid, Autor do clássico Kingdom Come (Reino do amanhã) e um dos roteiristas que mais compreendem e respeitam seus personagens. Waid escreveu várias histórias onde reuniu os diversos supervelocistas do universo DC, e eu adoro histórias que reúnem as variações do mesmo personagem. Em particular, são excelentes e inspiradas as histórias que Waid escreveu com esse mote. Além disso, no tempo em que escreveu o Flash, Waid elevou o superpoder do personagem a algo maior do que ele, inserindo Wally em uma continuidade onde uma só força do universo era a fonte motora de todos os supervelocistas. Sùbitamente, o superpoder do Flash deixava de ser único, e revelou-se que era derivado de um campo de energia que os mortais comuns não seriam capazes de atingir: a Speed Force. Nas mãos de Waid, o Flash tornou-se uma espécie de cavaleiro Jedi da velocidade, um privilegiado que, tal como Neo em Matrix e Luke Skywalker em Star Wars, tinha acesso a compreender significados ocultos na realidade e a perceber universo, tempo e espaço com um senso zen de unicidade. A Speed Force tem o efeito de uma força que não é mágica mas tampouco é compreendida ou sequer percebida pelos humanos, sendo uma energia que permeia o universo e que sòmente os supervelocistas conseguem explorar. Saem daí algumas histórias interessantíssimas onde conseguimos enxergar o mundo em câmera lenta através dos olhos do corredor escarlate à medida em que, aos poucos, Wally descobre que seu poder de velocista traz várias utilidades colaterais, como a viagem no tempo e a possibilidade de dar “carona” em sua velocidade para outras pessoas. Além disso, o roteirista Waid tratou a memória de Barry Allen com uma reverência religiosa, criando em Wally o desejo de conhecer melhor o destino de seu tio-afim no século 30 e de ter contato com a realidade ampliada que havia alimentado Barry e que sòmente agora se fazia visível para ele. No início de 1996, The Flash contava o arco Dead Heat, em várias partes, onde Wally se esforçava por impedir que o vilão Savitar desabilitasse todos os heróis cujo superpoder é a corrida: o próprio Wally, Jay Garrick, o jovem Impulso (Bart Allen, neto de Barry, nascido no século 30), Johnny Quick, sua filha Jesse Quick, o sábio Max Mercúrio (um velocista revitalizado por Waid, nascido no Velho Oeste, viajante do tempo e, já com uma certa idade, mentor dos outros velocistas) e alguns outros. Para vencer Savitar, Wally teve que acelerar de um modo que nunca lhe fôra exigido, entrando na correnteza do tempo e, sem controle, viajando para o século 64. Na sequência Race Against Time!, após a vitória sobre Savitar e já no segundo semestre de 1996, Wally tenta voltar para sua época em sucessivos saltos que vão retrocedendo ao longo dos séculos. Um dos personagens que o auxiliam é John Fox, o Flash do século 27, herdeiro do manto inspirado na memória de Barry e de Wally. Na continuidade das histórias, estou em dezembro de 1996, no ponto em que Wally consegue voltar ao século 20. Acontece que, ainda na luta contra Savitar no início do ano, Wally havia sido auxiliado por uma corredora de codinome XS (lê-se “excess”), que aliás também é uma neta de Barry Allen nascida no século 30 (e prima de Bart). Em Deat Heat, XS havia voltado no tempo, de seu século 30 para o século 20, juntamente com seus colegas da Legião dos Super-Heróis, e havia ficado presa aqui. Assim como Wally passa a usar a Speed Force para voltar do futuro para o presente (e afinal consegue), XS tenta saltar em sentido contrário, do presente para o futuro (que é o “presente dela”). No título The Flash, nas edições de 1996, a jovem heroína XS é apenas um personagem coadjuvante, e chega um momento (no primeiro capítulo de Race Against Time!, The Flash #112, abril de 1996) em que John Fox e Jay Garrick a auxiliam a dar um salto no tempo. XS desaparece, o Leitor é levado a presumir que ela tenha conseguido voltar para casa, e a história volta seu foco para o Flash, suas desventuras e seu retorno feliz. Barry dá a XS o privilégio e a honra de correr com ele e então consegue servir como catapulta para ela, novamente a lançando na correnteza do tempo. Desta vez, XS vai parar no século 100, onde descobre que a Terra já não existe (é aqui o ponto em comum com os outros anuais de 1996, Legends of the Dead Earth), assim como já não existe a Legião dos Super-Heróis. No planeta Almeer-5, a humanidade é oprimida pelo vilão Nevlor, que aprisionou os poucos meta-humanos restantes. Um dos heróis presos é Avatar, que empunha a milenar Lança do Destino, a qual só pode ser levantada pelos dignos. Seu traje assemelha-se aos dos deuses de Jack Kirby, em particular ao de Thor, da Marvel, cujo martelo Mjölnir sòmente os dignos podem levantar. Outra heroína é Melissa Trask (anagrama de “Stark”, pegou? ), que é uma brilhante engenheira eletrônica e criou uma armadura que voa e dispara raios das mãos (tal como a do Homem de Ferro…). O terceiro herói é Robert “Bob” Brunner (como Robert Bruce Banner, certo? ), que, graças a uma transferência de energia (raios gama? ), transformou-se em um megamusculoso gigante azul (e não verde, OK?). As roupas se rasgam e ele fica só de calção e arremessa homenzinhos. O último herói, dito o maior de todos do século 100, não tem superpoderes, mas chegou ali em animação suspensa para liderá-los, com seu capacete com asinhas e seu traje com uma estrela no peito (tal como, vejamos, um certo Capitão América…). Com a ajuda de XS, os heróis escapam e se reúnem em uma nova base secreta construída por Stark Trask, a Mansão dos Vingadores. Observe que as palavras “Almeer” e “Nevlor” contêm as letras de “Marvel” e (Stan) “Lee”. Recebendo nova ajuda dessa Legião “Vingadora” do século 100, XS consegue entrar novamente na correnteza do tempo, mas, em vez de voltar para casa, vai parar no Ponto de Fuga, a base espacial dos Homens Lineares, situada estàticamente em uma dimensão paralela durante o último instante de tempo antes do fim do universo. Às vezes o Ponto de Fuga aparecia nas histórias da DC dos anos 90, inclusive na minissérie Zero hora. Ali, XS encontra o Senhor do Tempo (Time Trapper), um vilão das histórias da Legião dos Super-Heróis — que, porém, ela não conhecia, porque não houve confrontos com ele depois que ela passou a integrar a Legião. O Senhor do Tempo tem domínio das linhas de tempo, que muitas vezes manipula para alterar eventos a seu favor, mas, neste breve encontro, ele se apresenta a XS como alguém que age assim a benefício da raça humana, em contraposição aos Homens Lineares, que patrulham as linhas de tempo contra interferências e, entre outras coisas, impedem que o planeta Terra seja salvo da destruição. Sob essa óptica, o Senhor do Tempo é que é o herói! Antes que ele a envie de volta ao século 30, XS consegue testemunhar os eventos de Zero Hora sob a perspectiva dos Homens Lineares. Embora ela não entenda o que está acontecendo (pois é uma personagem criada por Mark Waid após a publicação de Zero hora), o Leitor consegue reconhecer diversas falas dos Homens Lineares, de Waverider e do Átomo, assim como a morte do Átomo, que foi um dos desdobramentos da minissérie. O roteirista nunca explicita que é o Zero Hora que estamos vendo, mas deixa a conclusão bem disponível enquanto conseguimos observar os mesmos acontecimentos sob uma perspectiva diferente. Curiosamente, a história de Legionnaires Annual #3 não foi escrita pelo consistente e cuidadoso Mark Waid, mas por Roger Stern. É uma história tão coerente, tão bem encaixada no universo DC, tão alinhada com as histórias do Flash às quais está ligada, tão perfeitamente elegante diante das cronologias de Zero Hora e da Legião dos Super-Heróis, que você pensaria que Waid fosse o verdadeiro Autor. A obediência à continuidade e o tratamento respeitoso (e não debochado) dos heróis da Marvel mostram um vínculo afetivo aos quadrinhos que tìpicamente vemos na obra de Waid. Fica o elogio ao excelente trabalho, não só de quem escreveu como de quem desenhou (Tony Castrillo, Chuck Wojtkiewicz e Dan Jurgens, o último dos quais foi quem desenhou o trecho “Zero Hora” e fôra também o desenhista da minissérie Zero Hora original) e, especialmente, de quem editou (Ruben Díaz e K.C. Carlson, que fôra editor de Zero Hora). (*) Sim, estou parcialmente ciente do efetivo retorno de Barry Allen após a Crise Final. Como eu disse, minha leitura está em 1996 e, neste ponto, permanece a intenção da DC de manter Barry morto definitivamente.